The cigar industry is full of stories. Some of them true, plenty made up, and all embellished in one way or another (“the [insert family name here] family has been in the business for 200 years, and the farm was personally blessed by Fidel Castro, Pope JP II, and Michael Jordan“). In fact, the cigar world seems so full of stories like these that it’s a bit of a surprise when a cigar company decides to create a cigar based on popular culture. The Highclere Castle by Foundation Cigar Co. is one of those cigars, hitching a ride of the coattails of the popular television series Downton Abbey. Melillo subsequently crafted a cigar that reflects that historic flavor profile and smoking style. 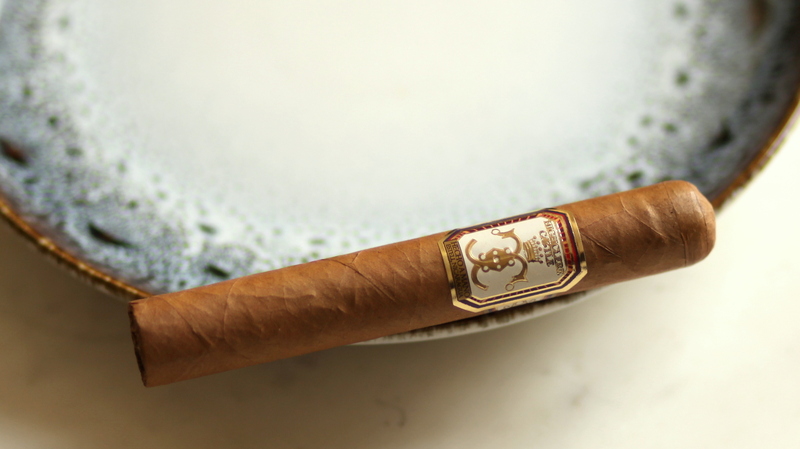 The Highclere Castle Cigar is hand rolled in Estelí, Nicaragua, using a Connecticut Shade wrapper, and both Criollo and Corojo from the volcanic soils of Jalapa and the island of Ometepe. The binder is made from Mata Fina, a dark tobacco from Brazil. The blend is finalized with an exclusive hybrid seed the company has named Nicadán. And luckily for Highclere Castle, Nick Melillo paid real attention to quality, uniqueness, and presentation in the making of this cigar. With that, let’s get on to the review. The Highclair Castle is a beautifully branded, impeccably constructed cigar. I love the white, red, and raised gold on the band. It complements the light Connecticut wrapper very well. After a straight cut, I test the draw, which is moderately restrictive, which I hope doesn’t create issues with smoke production. The pre-light draw is very light and clean, with some grassiness and sweet tobacco evident, along with a very light spice. Highclair Castle opens with extremely flavorful, medium body/full strength smoke. Opening notes include sweet hay, almonds, toasted bread, cedar, and a floral finish. The texture is very smooth, with a finely ground white pepper on the retrohale. This cigar is a sipping cigar—not to be smoked too quickly as the strength can quickly overwhelm my palate. At an inch in, the flavors become more condensed and the strength of flavors is now in the full range. The almond note becomes stronger, and I sense some black pepper entering into the profile as well. The tightness of the draw does seem to have affected smoke production, but Highclere Castle is still in an above average range in terms of the amount of smoke produced. The second third sees the pepper notes ramp up on the retrohale, and the cedar becomes drier. Most prominent are the nuts (which at this point are closer to peanuts than almonds) and the floral/vanilla notes. The burn has been entirely straight throughout the cigar. In the final third, the bread note morphs into a burnt toast (overly burnt, that is), the smoke temperature picks up, and some harshness creeps in. That’s really quite heartbreaking as I was enjoying the cigar immensely. The floral notes pull way back, and the pepper increases. At around an inch and a half left, the smoke has become so overpowering that I set the cigar down. 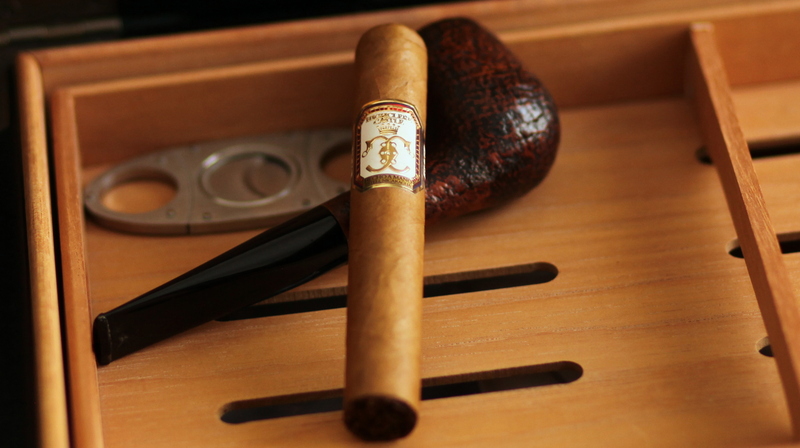 The Highclere Castle Robusto by Foundation Cigar Co dishes out big, complex flavor. It also delivers great smoke production and good construction. Besides the final third (which was not a winning way to end the experience), I thought at times the flavors fell out of balance in significant ways. The moments of balance though? Pure bliss. If you can shell out $16 for it, give this cigar a try. If you’re on a tighter budget, I recommend the Oliva Connecticut Reserve, which I think offers a similar experience.